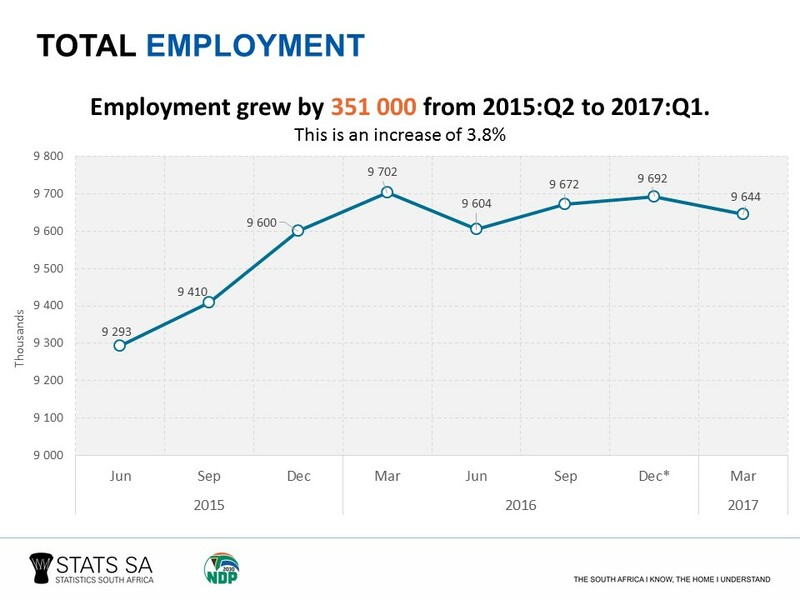 With South Africa formally in recession and hoping for some good news, the latest employment figures released by Statistics South Africa (Stats SA) holds no reprieve. 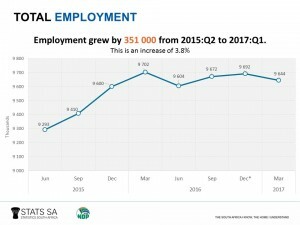 According to the March 2017 Quarterly Employment Survey (QES), an estimated 9 644 000 persons were employed in the formal non-agricultural sector of the South African economy. This reflected a net quarterly decrease of 48 000 employees between December 2016 and March 2017. Decreases in employment were led by the trade industry with 32 000 employees, the business service industry with 23 000 employees, the community service industry with 8 000 employees, the manufacturing industry with 4 000 employees and the transport industry with 1 000 employees. Decreases in employment in these industries were reportedly due to end of contracts for workers who were employed during the festive season. However, it’s not all bad news. There were increases in employment reported in the construction industry with 12 000 employees and in the mining industry with 8 000 employees. 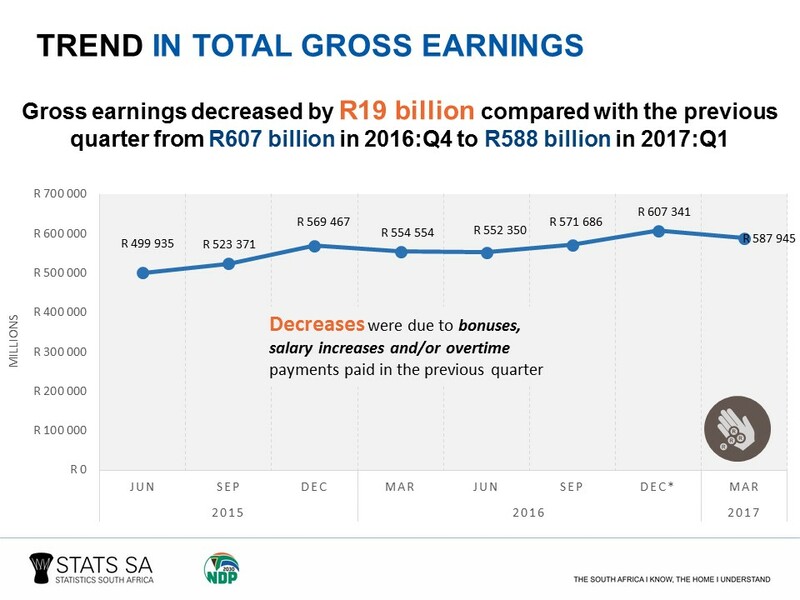 It therefore comes as no surprise that there was also a quarterly decrease of R19.4 billion or 3.2% in total earnings paid to employees. Total earnings paid to employees amounted to R588 billion in March 2017, down from R607 billion in December 2016. 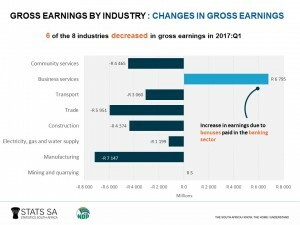 Decreases in gross earnings were led by the manufacturing industry with R7.1 billion quarter-to-quarter, followed by the trade industry with R6.0 billion, the community services industry with R4.5 billion, the construction industry with R4.4 billion, the transport service industry with R3.1 billion and the electricity industry with R1.2 billion. 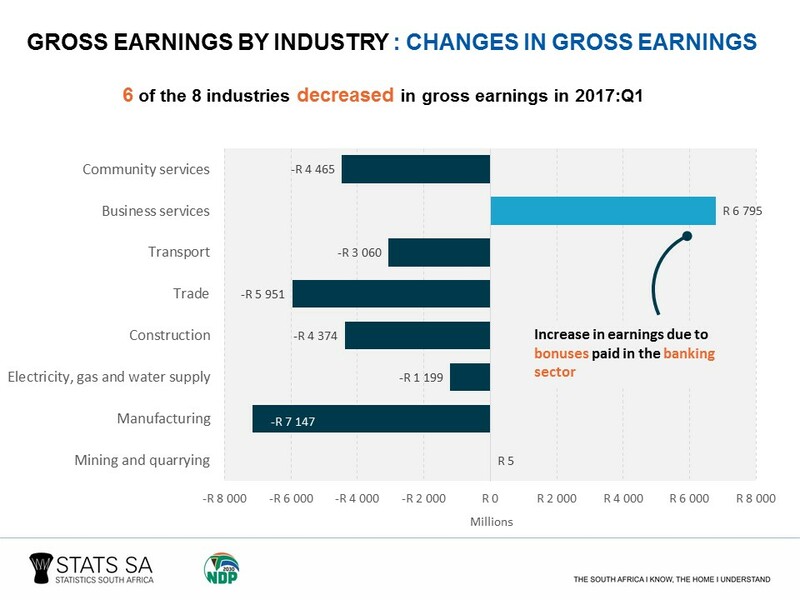 However, there was a quarter-to-quarter increase in gross earnings for the business services industry with R6.8 billion and the mining industry with R5 million. 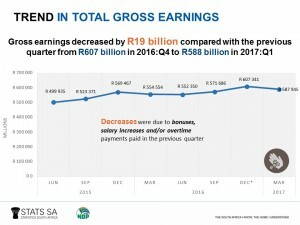 The general decrease in gross earnings from December 2016 to March 2017 quarter was mainly due to the payment of bonuses and overtime in December 2016. Download the complete publication here.